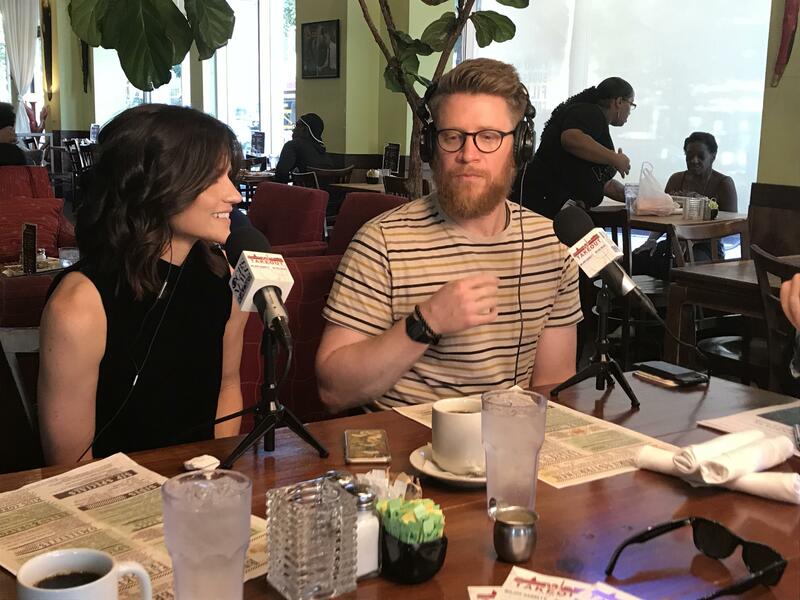 Preview: Sean Doolittle on "The Takeout"
"I just had my coffee this morning, but I think we're ready," Nationals relief pitcher Sean Doolittle quips as we settle in to record "The Takeout" podcast hosted by CBS News' Major Garrett. At the time of our meeting, Doolittle is just days away from returning to the field after a two month stint on the disabled list. But we're not here to just talk baseball. Doolittle and his wife, Eireann Dolan, are community activists, and have taken an interest in social causes ranging from LGBT rights to Syrian refugees and better care for veterans. "We do a lot of background work, making sure we're not out there kind of spouting off and sounding uninformed because that undermines everything we're trying to do," says Dolan before ordering breakfast. "What's the loudest food I can eat into a microphone?" Dolan asks the waitress at Busboys and Poets, a restaurant and bookstore in DC's 14th Street corridor. Dolan settles on the granola. "We'll do some fruit so people think I eat healthy as an athlete," Doolittle says while ordering turkey sausage, eggs, and whole wheat toast. When it comes to their social activism, Doolittle says he wanted to use his platform for good. "I wanted to make the absolute most of this opportunity to play in the Major Leagues," he says, because he knows he'll only be in the spotlight for so long. "I feel so fortunate to be here, and I want to give back." Among the many causes they champion, Doolittle and Dolan have raised money to help wounded veterans for the non-profit Operation Finally Home. "I come from a military family, and one of the first things we got involved with was a military charity," he says. "I think the way we got some fans involved made us really realize the impact that you can have using this platform. It's been really rewarding for us to get involved in the communities that we've played in." In 2015, as a member of the Oakland Athletics, Doolittle and Dolan sponsored the team's first ever LGBT Pride Night. "The initial responses on social media weren't all positive," he said. "But we really wanted to jump in and kind of make sure that, that experience was something that people from the LGBT community could feel safe coming to, could feel proud about being a part of." When the backlash to the LGBT night began, Dolan and Doolittle started a campaign to buy back tickets from customers who were no longer interested in attending the game on Pride Night. "If you didn't want to go, that's okay, we'll buy your tickets back, and we'll donate them to people that want to go," said Doolittle. "It worked. People just started donating money in addition to tickets." "We were able to have almost a thousand young LGBT people in the community who were maybe homeless or needed sort of a community center, or they were sort of at risk," Dolan remembers, "and they were able to come to the game. I know that's not the highest demand they have in that community, but it was a night that they maybe wouldn't have had otherwise." "I love the game so much, I want everybody to be able to experience it a little bit of the way that I've been able to experience it, I want to share that with people," says Doolittle. "It kind of goes both ways, we're so grateful for the support that the community gives me, that they give us when I'm on the field, that we want to give back and get involved." Doolittle and Dolan got married last year after finding each other in an unlikely place. "We met on Twitter," Dolan says. "Let's just get that out of the way right off the top. It's embarrassing. When we were on there it was a little community where people were making jokes and having fun." The couple says they would banter on Twitter, then met in person after a former teammate of Doolittle's, who also knew Dolan, said they would get along. "We went out for frozen yogurt and the rest is history," Doolittle says. "Social media has been an overall really positive experience for us," says Doolittle. "It's helped us get involved in the community." This episode of The Takeout was recorded on September 6, 2018. For more of Major's conversation with Sean Doolittle and Eireann Dolan, download "The Takeout" podcast on Apple Podcasts, Google Play, Stitcher, or Spotify. New episodes are available every Friday morning. Also, you can watch "The Takeout" on CBSN Friday at 5pm, 9pm, and 12am ET and Saturday at 1pm, 9pm, and 12am ET. For a full archive of "The Takeout" episodes, visit www.takeoutpodcast.com. And you can listen to "The Takeout" on select CBS News Radio affiliates (check your local listings).